The directors of a condominium, co-op or homeowners association often think they have all the insurance coverage they need — until they get sued and find themselves on the hook for enough legal fees to land them in bankruptcy court. Large insurers often offer blanket community association insurance that covers accidents, property damage and other common risks. They also offer Directors and Officers (D&O) coverage for the volunteers who serve on association boards. Which coverage is often missing from standard community association insurance policies? What questions to ask to ensure your coverage protects you and your fellow volunteers against devastating financial settlements? Why you need a dedicated D&O policy from an expert provider? Volunteering for your HOA board should not be a path to financial ruin. 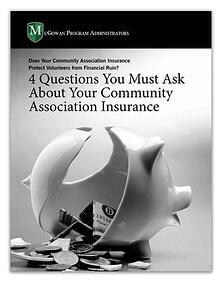 To learn how to protect yourself, download our free guide: 4 Questions You Must Ask About Your Community Association Insurance.